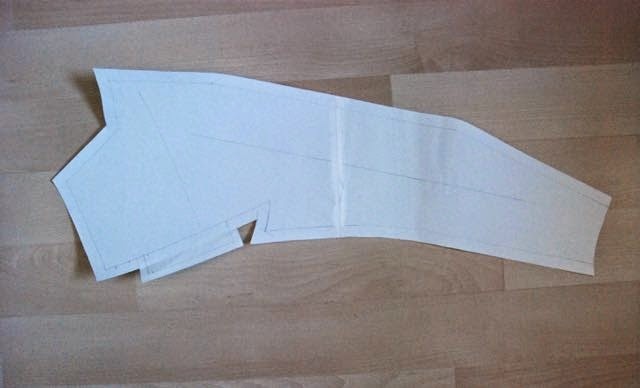 In fact, I'm pretty pleased with my progress so far, even though I haven't constructed any part of the actual dress yet. I'm getting a pretty clear idea about how I'm going to make it and that makes a huge difference. 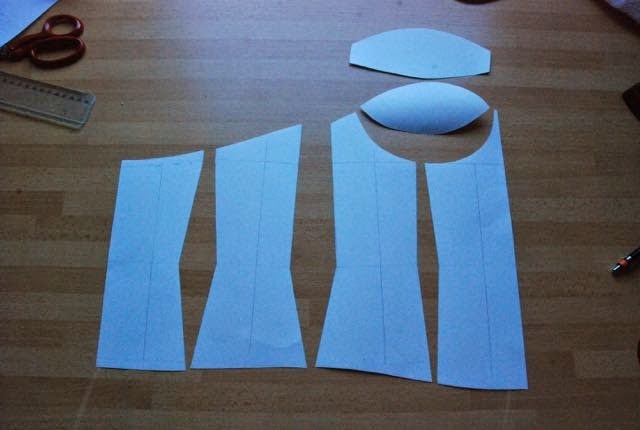 I've started at the beginning: By making the fitted bodice with bra-style cups which forms the basis for this design. 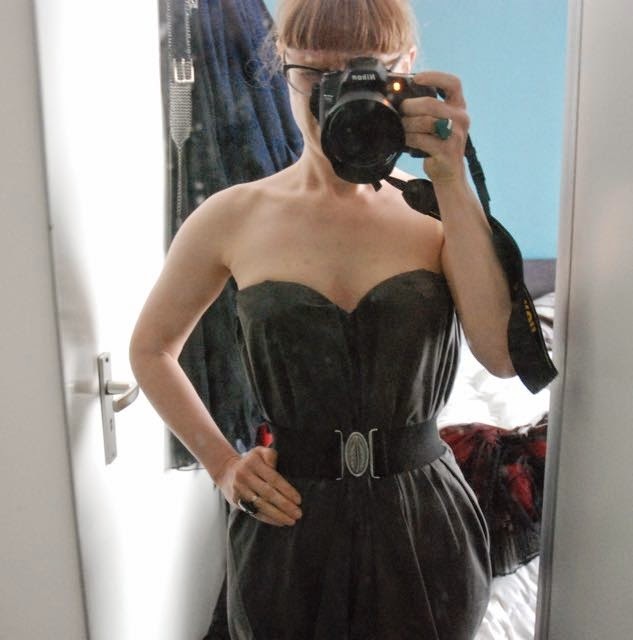 This is a bit of a cross-over between clothing and lingerie patterns so I thought I might talk you through the process I used. The cup pattern pieces come from my normal bra patterns. A horizontally seamed cup for a strapless design with a curved top edge. I drafted the bodice from scratch. That seemed easier than fiddling with a body wear sloper with negative and a normal body sloper with positive ease. - Distance from the waist to the underwire of your bra. To measure this, tie a ribbon or a piece of elastic around your waist, tightly so it automatically comes to rest at the narrowest point, and measure up from there. - Draw a horizontal line the length of half the 'hip' measurement and square up from either end and the middle. Also draw in the waist and underbust height. - Place the center front of your bra band pattern along the center front line and the bottom of the curve for the cup on the underbust line and trace the bridge, cup curve and beginning of the top of the band. - Mark 1/4 of the underbust circumference from either side on the underbust line. 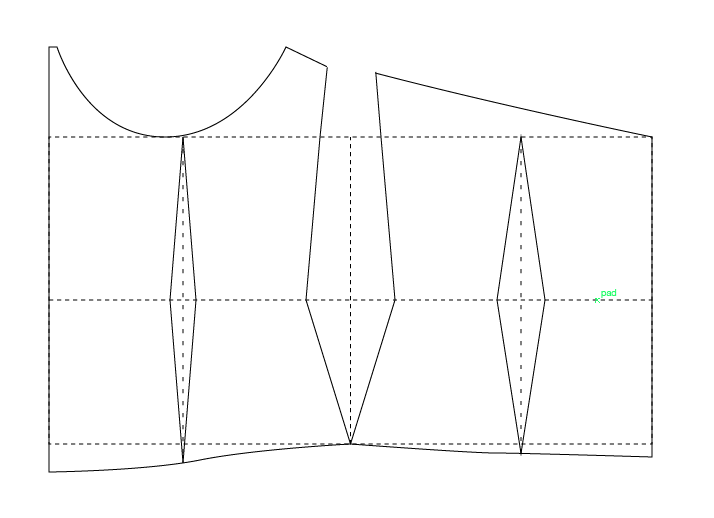 Square up to the tracing of the bra band and shape the top edge of the bodice. - For the waist shaping, divide the waist measurement by 2 (because we are working on a half pattern here) and then by 12. Take out 3/12 on either side of the center line, this will become the side seam. Then take out 2/12 in the front panel and 4/12 in the back. - Connect all the points you've measured out and don't forget to mark the straight grain (perpendicular to the waistline). When cutting, mark the waistline on all pieces and match those marks when sewing. Of course, a pattern like this may need quite a bit of fine-tuning so I decided to sew it up to try the fit, using the fabric I plan to use for this layer. I made the cups from lingerie foam (I think you have to use a material which can stand up on its own for this shape) in my usual way and sewed them into the bodice. For fitting purposes, I put a separating zipper at the back. 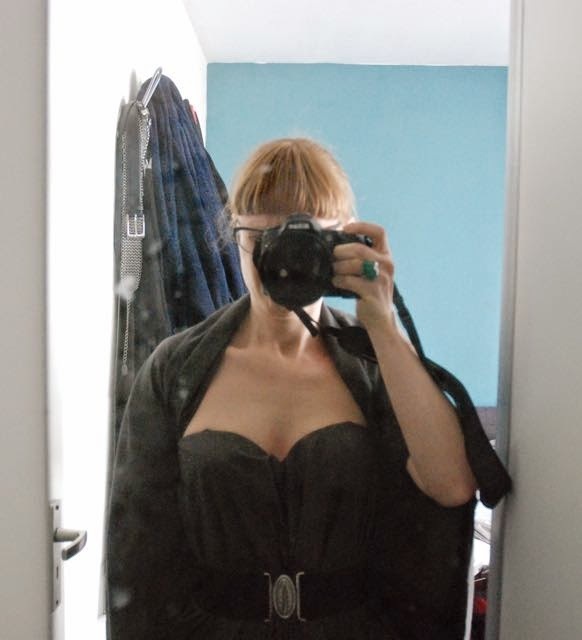 And this is the fit, with underwires but without boning (and pushed up weirdly at the bottom because of the fabric I put around my hips for the picture). Not too bad, if I say so myself. Later, I sewed poly boning to half of it and it looked even better (I plan on using spiral steel for the real thing). Based on this try-out I've made a few changes: I cut the pieces with seam allowance on the bottom but I like the length like this, so I will add 1.5 cm. I really didn't like the way the cup and the top of the bodice look like completely different things where they meet at the side. I raised that point by 1 cm to make them join more smoothly. And finally, I shaved of a couple of millimeters at and just below the waist at the side seam and front dart, because it was a bit loose in those places. After that, I spend a lot of time thinking about the order of construction and the way to finish this thing, with the draped fabric on top, neatly. But more about that later. P.S. This would also work well as a pattern for a lingerie corset. Just make the center back panel a bit wider compared to the side back, then narrow it about 10% for negative ease. Cut that part out of power net and use something like sturdy satin or lace over non-stretch net for the rest. As of yesterday, I've dropped all other sewing projects I was thinking about or even working on. Some things take precedence. On Monday, we got a message from a friend asking whether or not we were coming to her wedding. We had never received the invitation. Thank you Dutch mail! 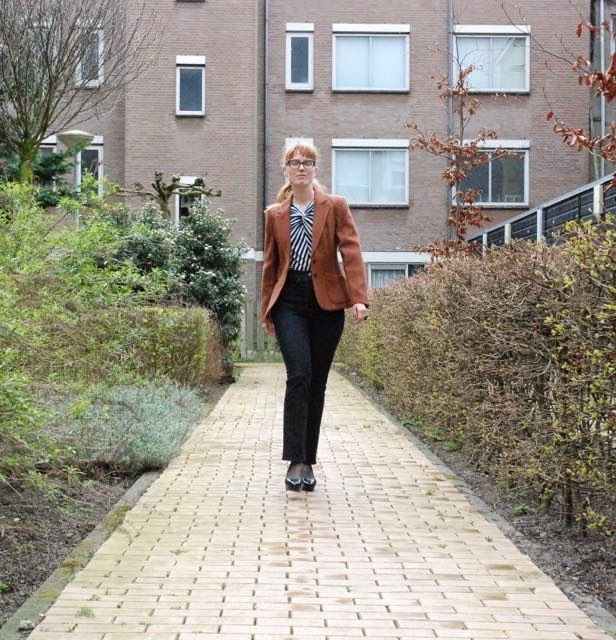 As I have mentioned before, the general dress sense here in the Netherlands is not very formal so I could probably get away with wearing some season-appropriate dress I already have. Especially if I take care to pick one which hasn't been worn around friends' parties. But what's the fun in that? If there is ever an occasion for something new and fabulous, it's a wedding, right? And this particular bride is a glamorous dresser in her own way. I've been thinking about it for two days and I now have three options, with varying degrees of a eh... work intensity. Sort of late 50's early 60's in style. A skirt with box pleats supported by a petticoat and a simple, kimono sleeved top with a slight scoop or a V-neck. Skirt in bright pink raw silk, top in black or grey jersey. The second option would require serious investment of sewing time. And of time otherwise dedicated to other things. 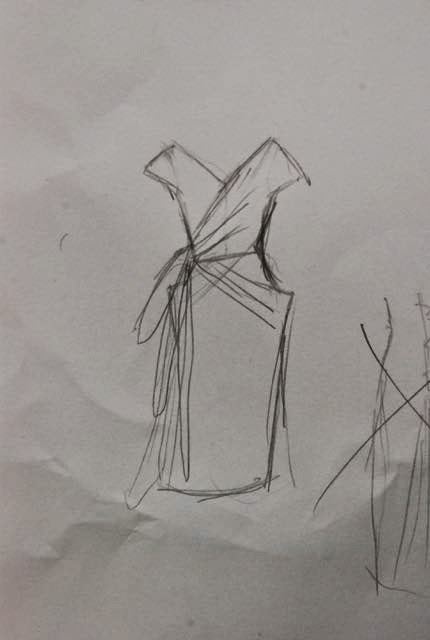 On the other hand, it's something I've been thinking about for a while: A party dress in which I can combine skills and knowledge acquired in my normal sewing and pattern making, lingerie making and working in bridal stores. So far, it wasn't a single clear-cut design. I just know it would include a corset-type bodice, with separate cups, draping over that and a slim skirt with some kind of flounce. I also planned on making it lace up at the back and spent quite some time thinking about solutions to have that and still be able to put it on on my own (which means I would need an extra closure. Like the busk on a corset. I'm just not going heavy enough with the construction of this to have it support a busk and there are super-strong zippers but I don't have any). I have a very humble, boring grey fabric in my stash which would I always had in mind for this. Plain fabric makes a design stand out and I actually look quite good in grey. 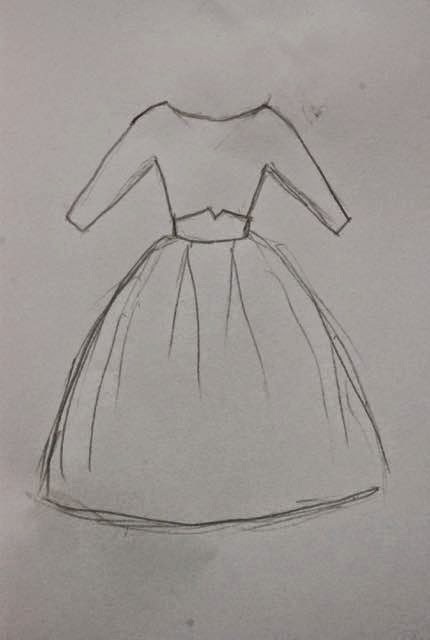 And of course, if I end up making a strapless dress, it would need some kind of cover-up (most modern wedding gowns are strapless and not all brides cover up for ceremony and/or dinner, but the bride is the star of the show and perfectly allowed to do whatever she likes. A guest, on the other hand had better stick to some traditional rules). 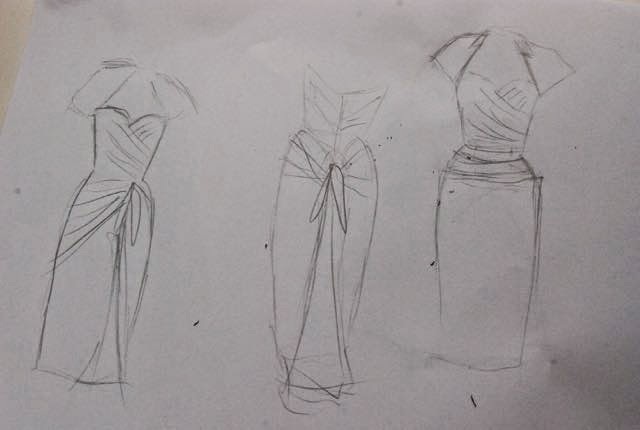 And then, I started to doubt the idea of a basically strapless design for me. And went to have a look at my collection pictures from vintage magazines on Pinterest. This is pretty close to what I have in mind. And I've always loved this one... just a little less asymmetric. Or something with a great collar, like this. Just as a dress. This is a much simpler shape, but a great neckline. And then, I found this picture. Just for the record, although it looks white in the black-and-white picture, this is described as an evening gown. Yesterday, that last consideration and the wish not to overwhelm myself, almost convinced me to go for option 1. Today, I was doodling not-strapless options for 2, which are nice but immediately because more normal and look like they would require a more interesting fabric. And then, I decided to try the look. 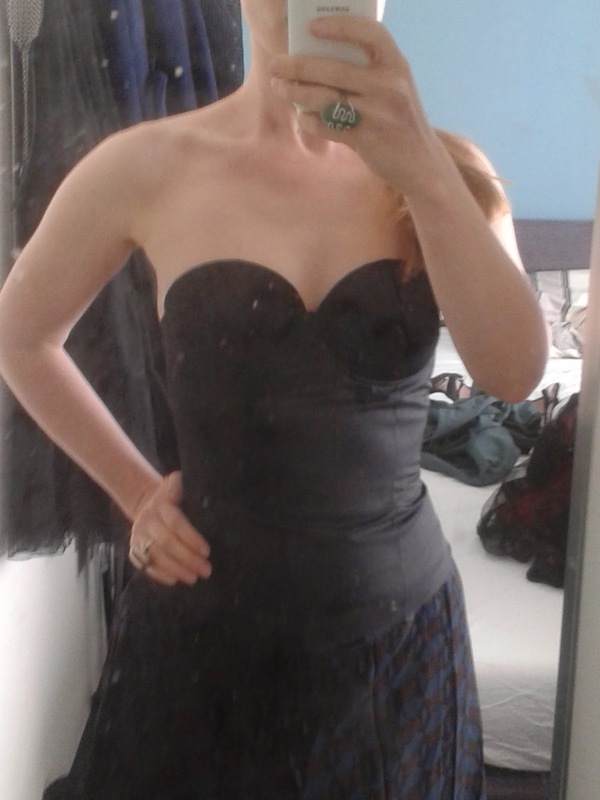 I stuffed one edge of the grey fabric into the top of a RTW corselette to see how such a shape worked on me. With and without covered shoulders. Of course, these are horrible pictures. Bedroom mirror selfies... But they show something. I can wear a shape like this. Why not go for it? I think I'm going to try. I will start by building the bodice, and then drape the fabric over it. I'm still a bit in doubt over skirt options: a flounce at the side front, sarong style, or at center back, sort of like a bustle. I won't do the lacing. It complicates too many other things. And I think I will make a separate little bolero to go with it. I'm going to give it a go. I'll get started tomorrow! Finally! My suit is finished, I've had a haircut, it has stopped raining and E is at home and willing to take pictures: It's time to reveal my new suit. I've talked about it here before. 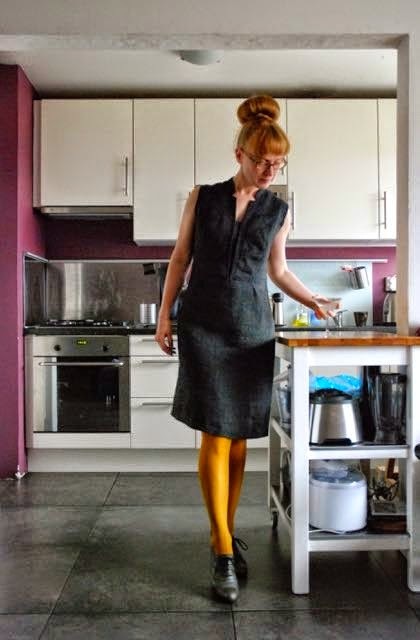 I drafted my own jacket pattern based on this image, from an issue of Libelle magazine from 1956 and added a half circle skirt which seemed to suit the look. Then, I decided to add a hat and after some experimentation with view C, I went with the pillbox which is view D and E from this pattern, V8008. The jacket isn't heavily tailored. I used a very lightweight fusible (a very thin knit interfacing) throughout, just to give this odd fabric a bit of stability. Making it more rigid would have helped to get that perfect period look but would have seriously compromised wearability. The way it is now, it may crumple when I make big movements but I will be able to make those which means it can work as a real garment, not just an occasional costume. And because I would like to wear it like some of these vintage suits or two piece dresses were, with not a lot under it, I lined it with thin, smooth cotton rather than with normal lining material. The fabric is a bit of an oddity. It looks like tweed, a herringbone weave in black and grey. But it's linen. For that reason, it has some odd properties. Linen, thickish but loosely woven. It's stiff and limp at the same time. In combination with my favorite fusible, it behaves very well. Without it, it's a different matter. I'm less than pleased with the way it worked for the skirt. It sort of folds in at the sides, even after hemming. It's wearable but not what I planned. In retrospect, I think I should have cut the skirt in four or even six gores, each with the straight grain along the centers. 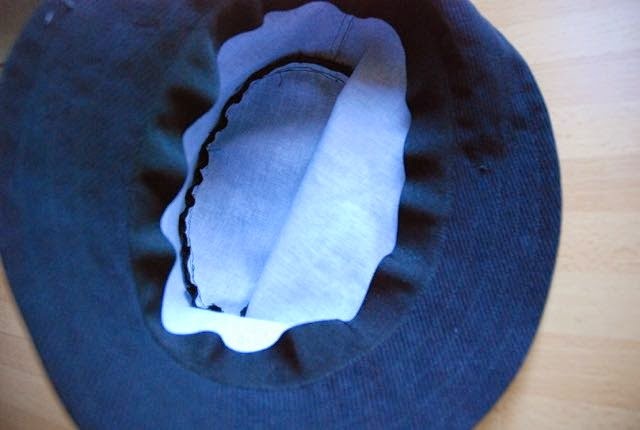 For the hat, I used the same fabric but interfaced it with a mid-weight fusible cotton (although for the bow at the back, I used the same stuff I used in the jacket). I lined it with thin synthetic felt. And to keep it on my head, I used two hairpins put through thread loops at the front sides and one on the back. Today, I thought I would show you some more from my collection of vintage (sewing) magazines. And try and show one of the reasons why I love having several issues of the same magazine, over a span of time. You see, when you read about fashion history, it's all too easy to start thinking there's one distinctive look per decade. One silhouette by which you can easily recognize it. It's easy to start believing that because there is some truth to it. Looking back, there are distinct shapes which belong to, roughly, each decade of the 20th century. In some cases, there is a clear starting date for something new, like the introduction of the New Look for spring 1947. However, things are, of course, more complicated than that. New silhouettes don't just spring into existence (even the New Look had careful precursors and its acceptance was slow and gradual), they can be a clear departure from what went before but more often, they evolve slowly from it. 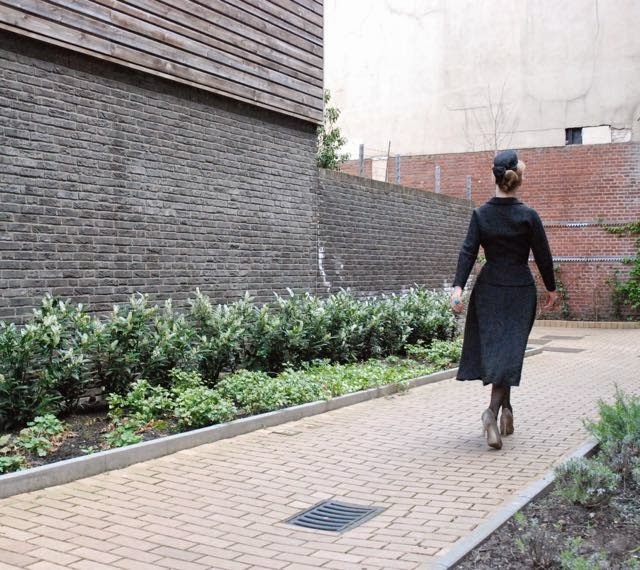 In the broad gestures of a short history of fashion, it's easy to overlook that process. When you are faced with a stack of magazines from the time itself, the little changes come to the foreground. The magazines compare the fashion they bring to their readers with that of last season or last year so they point out and magnify changes we, outsiders, might not even have noticed. To give you a bit of an idea about this, I've put some images from the early 1930's side-by-side. All are from the sewing magazine Gracieuse. These are the numbers 8 (the magazine was published twice a month, so that's the one for the second half of April) from 1930, 1932 and 1933 (I thought I had included 1931 as well but it seems I forgot). I've combined pictures for similar kinds of clothes, really different things which are not featured in the other years are shown separately. From 1928 to 1930, the cover is printed in colour, with a photograph or drawing on pale blue, from 1931 onwards there's a big full-colour fashion drawing on a white background. The great thing about these covers is that they are the only visual information about the colours fashionable at the time. Simple day dresses. Please ignore the fact that only in 1932, they decided to look ahead to the warmer weather to come. 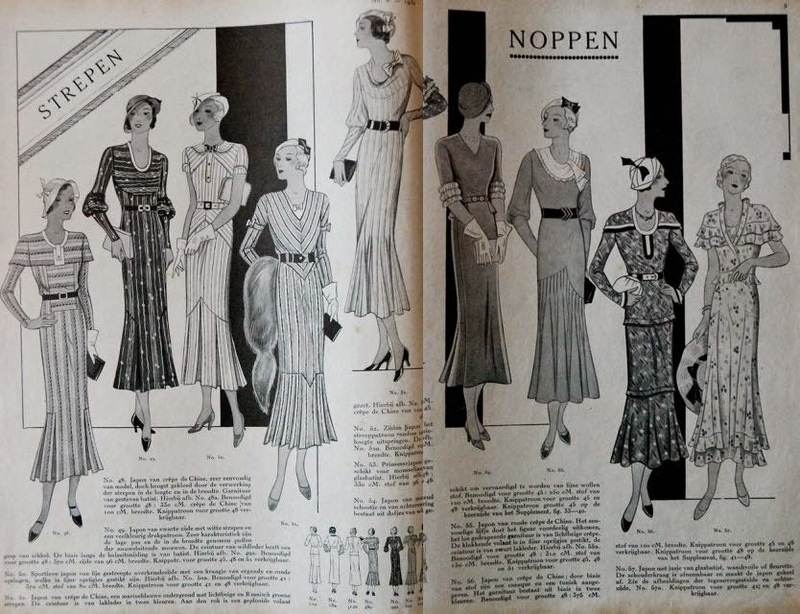 In the 1932 issue, they also included some more glamorous dresses, those with stripes are on the left and those with dots on the right. These show some of the flamboyance 1930's fashion is also known for, next to the tailored styles of the sportier dresses and suits. Oh, and the elbow at the join actually belonged to a lady near the fold of the page but the light on her was so bad I cropped the image. Walking outfits. From 1930 and 1932. 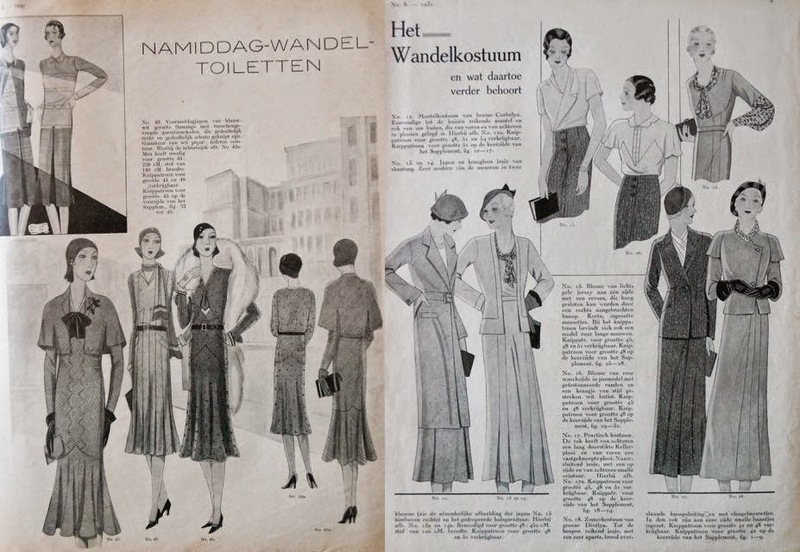 There are dresses with some jackets for 1930 and suits with coats and blouses for 1932. I'm pretty sure that's just the choice made in each magazine and not representative of all walking clothes worn in those years. But look at the difference in skirt length! And again, there's a slight shirt in the style of the drawing: From very straight-line ladies, to ones with slight curves. And a major change in hats, in this case a transition from something which looks very much like a 1920's cloche to a fairly typical 1930's hat shape. 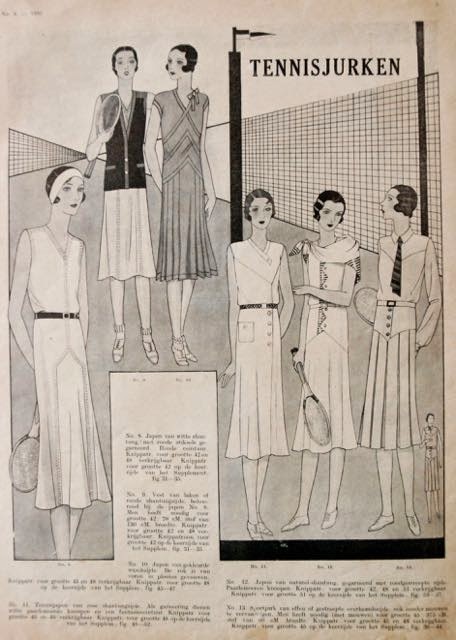 This particular issue of Gracieuse was a pretty sporty one in 1930: There were also tennis dresses! 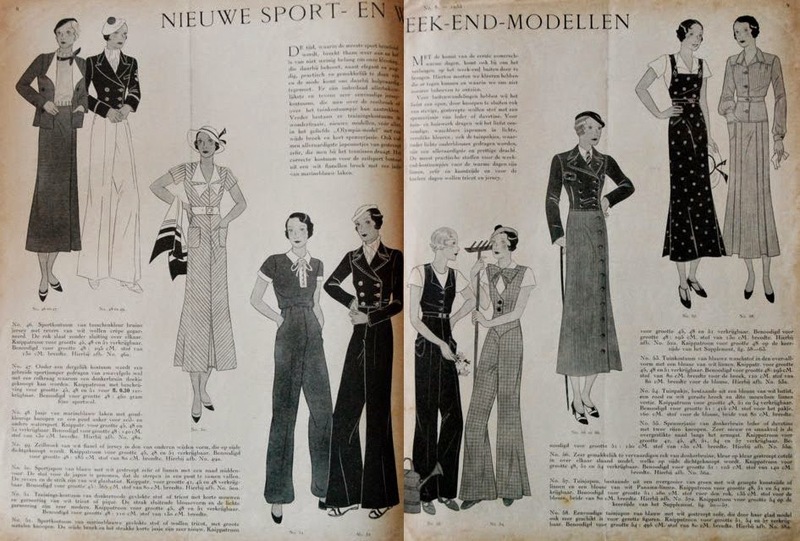 And in 1933, there was a double page feature with sports and weekend clothes. I particularly like this one because it includes what look like real trousers. So, just a couple of looks you might have wanted to make 82, 83 or 85 years ago... Any preferences? It seems like a long time since I posted a proper, well-considered story. You know, a blog post with a head and a tail. You'll have to excuse me once more. This is another update of random thoughts and project ideas. I have been sewing. I've finished my suit. There is still an issue with the skirt, which I blame almost entirely on the fabric. But, with regards to hat making, I gave up on the view of V8008 I started out with. Vogue's shape didn't even approach my head shape (and I don't have a small head, so I'm really surprised at that floppy disk this pattern created) and I didn't like the way those petals looked. Rather that taking all the binding off, tinkering even more with the shape and still end up with a look I didn't like, I cut my losses and went for the pillbox instead. The little pillbox in this pattern is one of those hats that has to perch on you head so there's preciously little fitting involved. It came together easily and will make its debut on the blog with the rest of the suit (in coming weekend, I think). Flush with this success, I started thinking about other hat styles I might be able to make. (Last year, I considered signing up for a real hat making course, to learn how to block felt and built hats from braids of straw. Budget didn't allow for it, but I'd still love to do it some day). 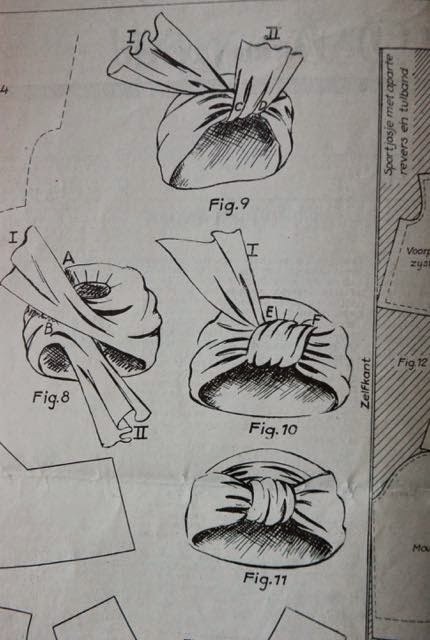 Some of the vintage magazines in my collection contain patterns for cut-and-sew hats. 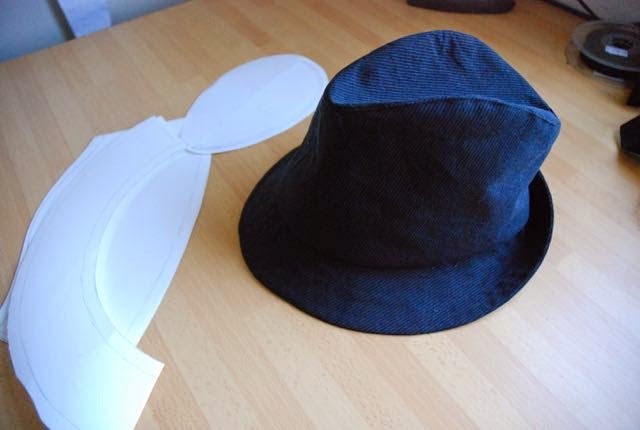 And then there was the cut-and-sew fedora which I had bought at H&M (in the sale, for 1 or 2 euros) years ago with the purpose of taking it apart and using the pattern. I've started out with that one. Unfortunately, I'm well overdue for a hair cut, so all hats look silly right now because they push my fringe over my eyes. Which is why I'm not modeling the hat right now. The original was a bit big (sized M/L, for a 56 to 60 cm head. Mine is 56 or 57 depending on the desired position of the hat) so I took it in a little bit. I used a cotton/linen blend fabric of which I have a lot and fused all the pieces with mid-weight fusible cotton. The original had an interfacing which seemed to be of a similar weight and this stuff worked well for the pillbox. With the hat finished, I think I should have gone for the heavy weight fusible cotton instead. At least in this fabric. This hat is softer and more floppy than the RTW original and I don't like how that makes it behave. When put on, it gets a sort of dent at the point where it leaves the head which rather spoils the silhouette. And the crown looks a bit too high anyway. 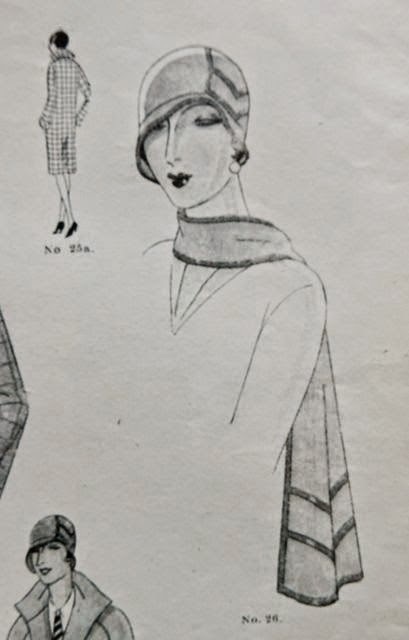 This asymmetric cloche from 1928, to be made with or without attached scarf (which is a cool idea but I think the hat would be more practical to me without) for Gracieuse magazine. 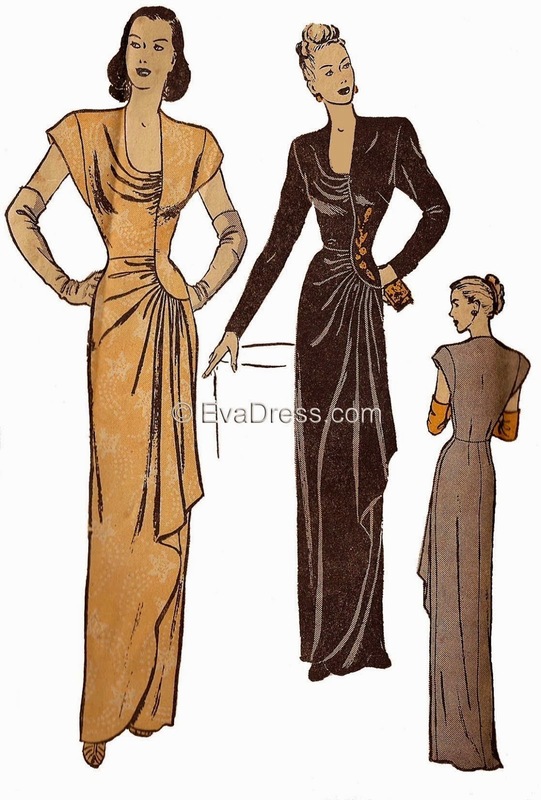 I first picked this out for my 1920's longlist for last year's Vintage Sewing Pattern Pledge. 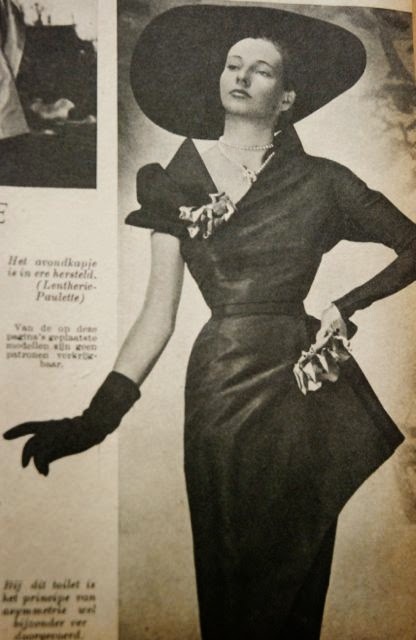 And this closed turban from Dameswereld from 1948. 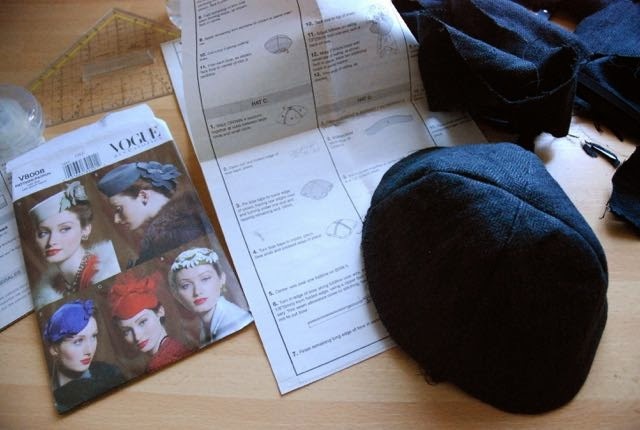 Turban style hats can be very nice but most online tutorials are for things which are basically twisted jersey headbands. In the tutorial for this thing, the editors distinguish between 'open turbans' which are fashionable to wear with dresses and 'closed turbans' like this one, which are proper hats and should be worn with outerwear. There is a scaled pattern, text and this drawing on how to tie it. It came with the pattern for a 'topper', a short coat for spring. Hat and coat could be made from the same fabric. Which is helpful information for me when considering fabric for this thing. Dressing like a proper lady? The jacket is finished and I like it. The skirt is largely finished but with this shifty fabric, it's absolutely essential to let it hang out before hemming. I wasn't really happy when I tried it on yesterday. I cut the skirt with center front on the fold and a seam with a zipper at center back. And slant pockets at the sides. Normally, that works very well but in this fabric, even after pressing, the side seams sort of fold in on themselves, making the skirt looks a look narrower (putting a petticoat under it makes the width show more but somehow isn't a good look either). I'm not panicking yet. Hemming always affects the drape of a skirt and usually, in full skirts, makes them stand out more. I plan on using a lightly interfaced hem facing for extra effect. While I'm waiting for that, I suddenly thought it would be nice to make a matching hat for this suit. I have black hats which might suit the style but one in the same fabric would be even better. And I've wanted to try and make hats for a while. In fact, the pattern I'm using now has been in my stash since well before I started taking pattern making lessons. 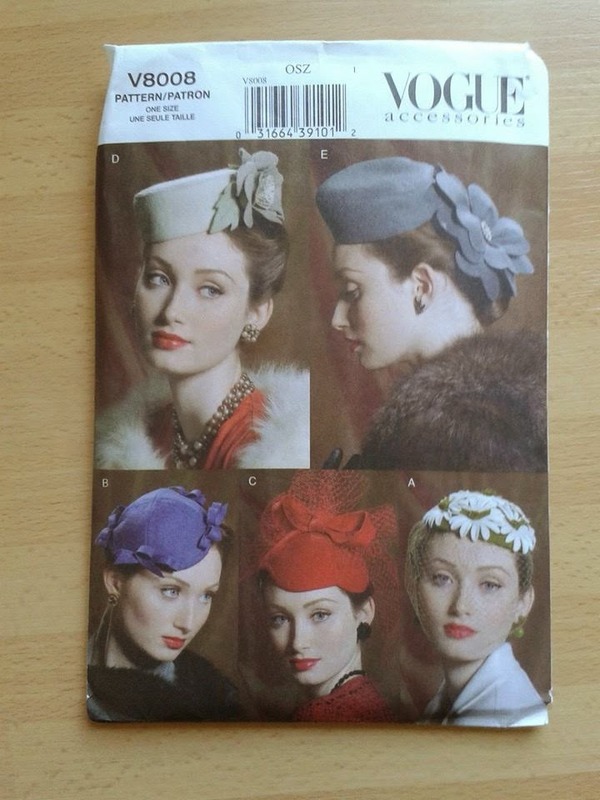 It's Vogue V8008, a selection of hats which have a clear 1950's retro flavour (despite the fact that this is not officially a vintage reproduction pattern). I've tried the pill box shape a short time after I bought it but didn't like it then. I didn't keep that version so I don't know if it was down to the material I used, taste or some real flaw. The annoying thing about this pattern is that all the designs are meant to be made in felt. Which, obviously has very different properties than normal fabric. I've decided to try out view C (the red one) anyway, using the suit fabric reinforced with some woven cotton interfacing. I've been tinkering with it for most of the afternoon. The pattern is simple enough: Four petal shaped pieces, with slightly longer curves on the side ones than on front and back. The interfaced pieces are nice and stable and keep their shape well. However, the hat in the picture encloses the lady's head neatly. When I first tried this thing on, all the sides were standing out. I've been going back and forth adjusting the shape to try and get a nice looking fit. In the process, I may just have changed the whole thing. Especially because I decided I don't like the look of this hat when tilted forward like in the picture. Not with my glasses and bangs. So, I'm shaping it to sit more at the back of the hat which kind of works against one of my motivations for making it in the first place. I want a hat that will work with the up-do's I like. 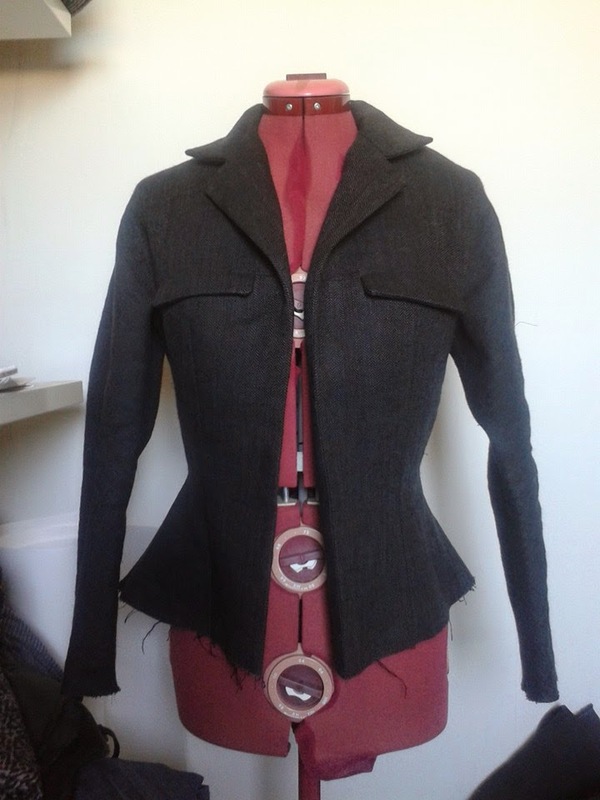 There has been quite a bit of progress on my new jacket! This time, I thought I'd be clever and have a bit of a chat about the pattern before showing off the finished garment (because that often leads to questions about the pattern). As mentioned before, my inspiration was this picture. The darted lower bodice is pretty standard. You will find a shape like that in many patterns and, when drafting your own, you take it straight from the sloper. The notched collar is hardly unique either. I did a full-on jacket collar draft because I like that but you could probably get a result like in the drawing with a simple convertible collar as well. The stand-out feature of this design is the yoke. With the sleeves and pocket flaps grown on. I love unusual takes on fairly standard shapes, which is exactly what this is. 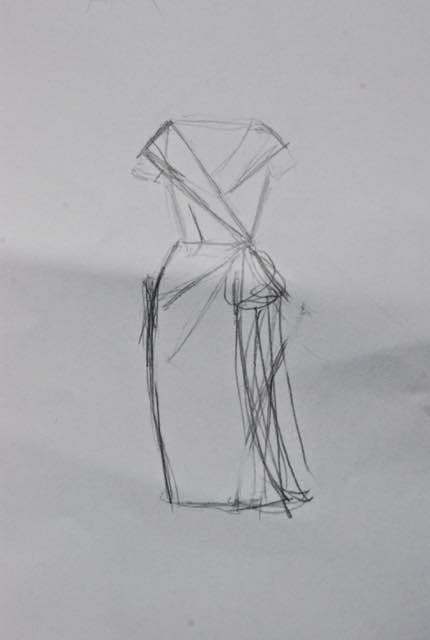 At first, I thought it would be easy to draft this using my kimono sleeved block (I've made that based on the normal sloper, to speed up the drafting process for dresses with kimono sleeves. It's for a fairly fitted kimono sleeve with an underarm gusset). As soon as I got started, though, I found a problem. Proportions. In the drawing, the lower bodice is long and lean and it is 'crowned' with that nice yoke and pocket flap arrangement. The pocket flaps look like they are right at the apex of the bust and the yoke seam is a straight line. On the kimono sleeved block, that isn't possible. A straight line at or just above bust level would end up in the sleeve. And I thought a curve would be rather noticeable. Instead, I went for a different option, constructing the yoke-and-sleeve more or less like a raglan sleeve. So, I took the upper bodice pieces from the standard sloper and grafted those only the normal sleeve. To keep that rather soft, flat shoulder line, I put them on a bit under the sleeve head (never recommended in pattern making instructions but I know my slopers and the result I want). With this drafting choice, several practical considerations came together: To make a sleeve like this properly, you need to preserve the lower part of the armscye. To achieve that and get the bust seam at the right height, I lowered the armscye by 2 or 3 centimeters. That should also help to get the looser look around the upper arms and improve the room for movement when combined with a small alteration on the sleeve. That particular sleeve treatment is something I explained in this post. With the yoke-and-sleeve done, I studied the picture carefully for the placement of the pocket flap. To keep it from making the sewing more difficult, I just used a 1 cm seam allowance for the flap (the flap curled up when I took the picture). I've tried the jacket on and the sleeves actually still look pretty slim but I can move properly. The proportions on the body look fine so I guess I should put the difference in the sleeve shape down to the inevitable issues you get when converting a drawing into an actual garment. Putting the ease for movement in the sleeves was not uncommon in 1950's suits though. 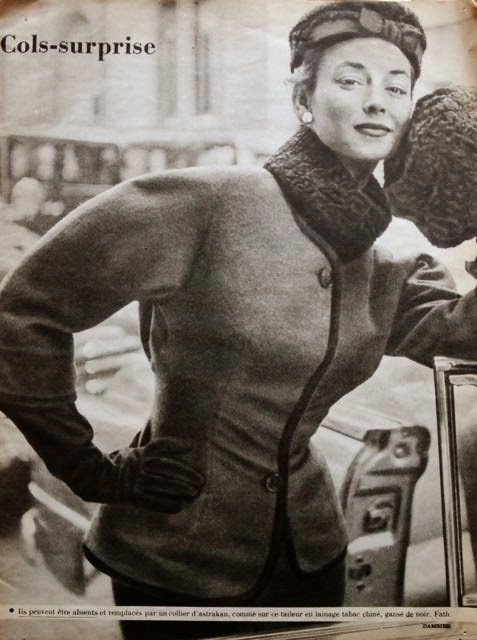 These images come from the French Elle magazine, the collection special for autumn/winter 1953. These suits are quite different in style from the one I'm making but both have very fitted bodices and fairly full sleeves. It's a very clever feature really. 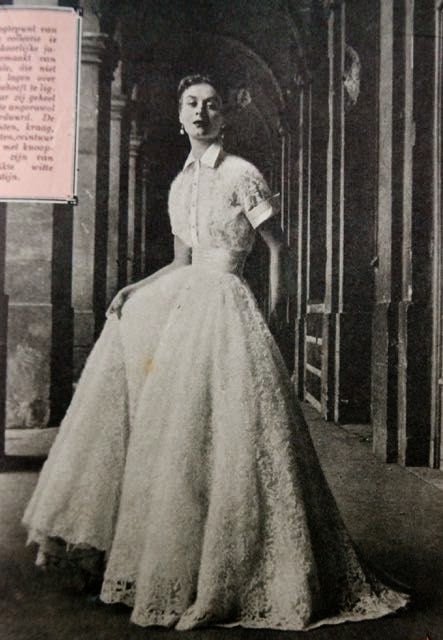 Not only does it set off that super-slim bodice, it also means the wearer can still use her arms. I won't look quite so wasp waisted in my suit (not without a corset... although these model might be wearing some rather hard-core underpinnings themselves) but that is kind of the effect I am going for myself. After last week's post about my to-sew list for spring, I really wanted to get started on that suit. 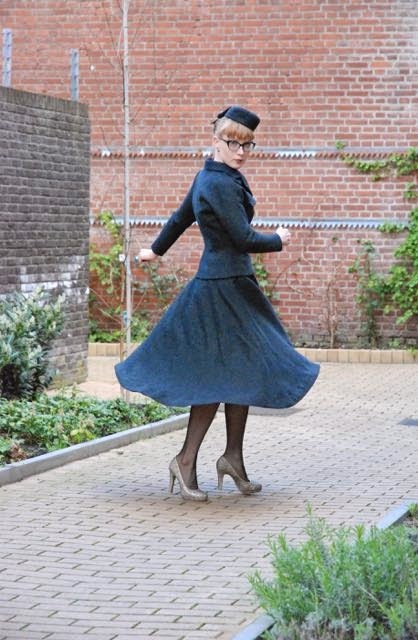 I've thought about making a 1950's style spring suit for two years, it's about time! However, I was second-guessing my choice. I absolutely adore this suit but I'm afraid it won't work with the fabric I had in mind. The original was made from jersey. As I mentioned before, I suspect that 1950's jersey is not really like the modern kind. For one, I guess there wouldn't be lycra or a similar elastic fiber in it. It probably didn't stretch lengthwise and may not have had great recovery either. The way it is often sewn up, with darts and zippers, suggests that it wasn't very stretchy at all. If you know more about it, please tell me in the comments. I'd really like to have a bit more of a clue about this. Anyway, even with that in mind, jersey is always a knit fabric. So, it would have some stretch and a certain kind of drape. Things which are used in this design. I may have a fabric in my stash which could work for it (although I'm a bit worried about how thick it is and how that would work with that big drape). The fabric I used for this dress. It's a not-very-stretchy knit, it might be a bit too stiff but, on the other hand, the design seems to ask for a bit of bulk. However, this stuff is warm. The picture was published in October, the suit was part of a winter collection. This choice of fabric would definitely make it a winter outfit too. I still love this idea and I will make it, but not now, not when the weather is clearly getting warmer. I know it's a bit dark and doesn't seem like a great choice for spring or summer but this is basically linen tweed. It isn't thin but because of the material, it's quite cool to wear. In fact, I haven't been able to wear that yet for that reason. Being thick linen, this fabric has a peculiar hand, kind of limp and stiff at the same time. And it creases like any linen. Those qualities make it extremely unsuitable for my first choice of suit but very appropriate for the coming season. 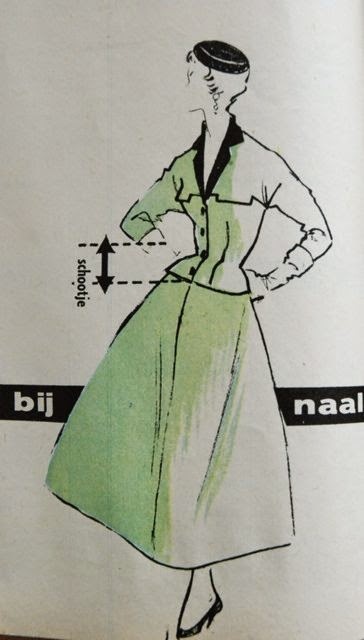 This drawing was published in Libelle magazine in 1956, as an illustration of an article about the proportions of the new fashion (that's why it has the dotted lines which indicate the length of the peplum). 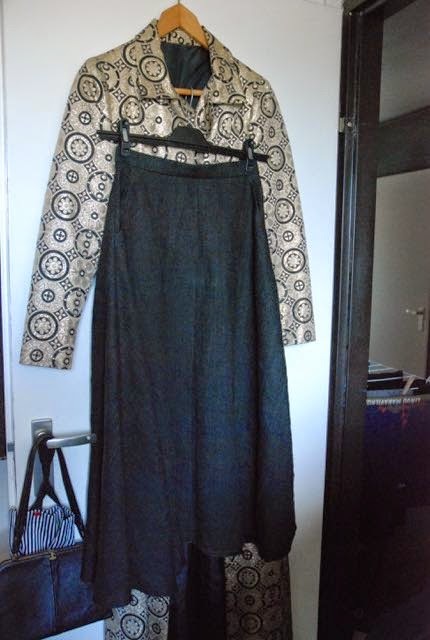 A full skirt like this would work well with my fabric and the short jacket works really well with it. I also really like the shape, with the sleeves and pocket flaps cut in one with the yoke. I drafted the jacket pattern yesterday. Because this was a sale fabric and I have a lot of it, I decided not to make a muslin. I've cut it out and I'm really curious to see how it will turn out. Does it already feel like spring where you are? Here in the Netherlands, we had a couple of nice days in March but the rest of that month was miserable. It seems to be warming up now though. There are a couple of those which beg for attention again this spring. 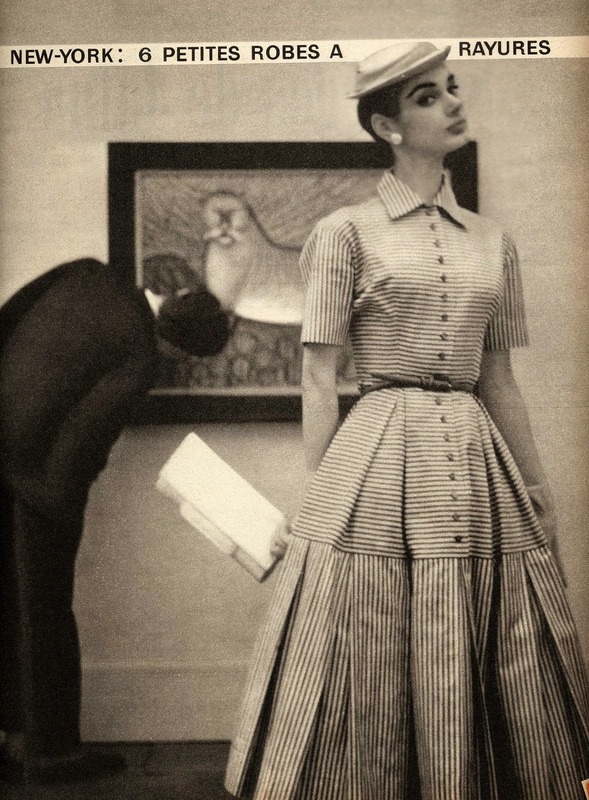 There's the striped dress with the pleated tiers. I've got fabric and buttons and the pattern shouldn't be difficult. The only thing holding me back (apart from, so far, the weather) is the fear of having too many shirt dresses. Which might be silly because I love them. Then, there's the idea of a spring suit. In vintage magazines, they always suggest that ladies carefully pick out a stylish suit for the warmer month and wear it for the first time on Easter day. I like the idea but I don't have summer-weight wool in my stash (and let's not even start about silk suiting) and I rather doubt I would have much of a chance to wear such a thing. However, since last autumn, I have a fabric in my stash that might be suitable. It's linen but a bit heavier than usual and in a grey and black herringbone weave. It would be cool to wear but looks like a sporty wool fabric. Not very summer-y but I'm not sure I care too much about that (not for every single item I make, that is). I've been turning the idea around in my head for a while. All the most sophisticated 1950's style suits have narrow skirts but this fabric is linen so it would crease rather noticeably. And I'd like my spring suit to have some kind of extra interesting feature. And then I remembered this from my Pinterest board. 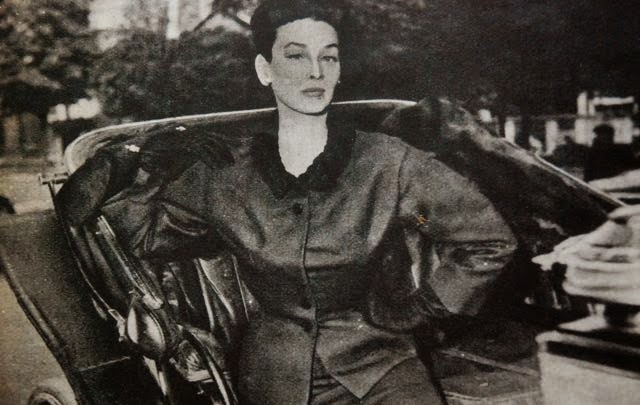 I found this picture of a grey jersey suit by Pierre Balmain in the magazine Margriet from 7 October 1950 (this was a weekly). According to the text, the panel on the skirt can either be worn as a simple, straight wrap-over or draped and pinned into the jacket pocket like this. I'm not so sure I could get that to work (I've often wondered about 1950's jersey. It's often treated like a woven. Here, some stretch would help with that drape but I wouldn't like to make that clean-cut collar and those pockets in a spongey, stretchy material like that) but I just love the look like this. And because all of the drama is actually in the skirt, I could make a much tamer pair of trousers to wear with the jacket for a very different look. 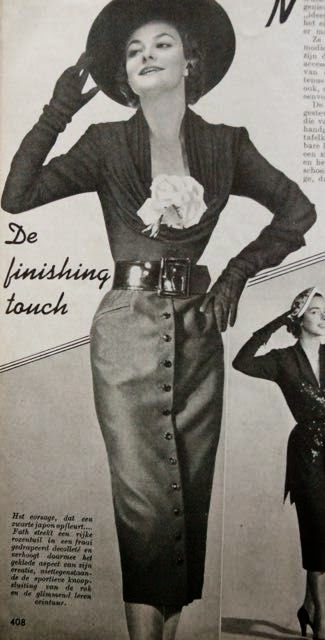 And then, there is my continued interest in draped and gathered 1940's styles. I have found some fabrics which should work for that. And all but one of the options would even count towards my Vintage Sewing Pattern Pledge. Speaking of which... If you take part in pledge or follow the posts about it, you've probably already seen this: Marie published the stash interview with yours truly on her blog yesterday. These interviews with participants are a new feature in the blog posts about this year's pledge and I was more than happy to take part. Reading blogs about (vintage) sewing, I sometimes get the impression that we all seem to be sewing with vintage patterns from the same, mostly American, companies (with the notable exception of the Lutterloh system). While this makes a lot of sense for American seamstresses and bloggers, it doesn't really for anyone who lives in a country which, back in the day, hardly imported those and instead produced its own patterns. Maybe it's my inner history geek taking over, but I love the designs and the social history I find in the magazines in my collection. I more than understand a stash like mine isn't for everyone. You have to be willing to do some very careful tracing. And be able to sew with little to no instruction. But I love it and I hope you will enjoy this little look in the stash. Of course, I will continue to share the contents of one magazine or another, every once in a while. When I first tried these on, I felt a bit silly about my earlier post. The look of these is barely boot-cut. I wouldn't have wanted to miss out on the interesting and insightful comments though. It's nice to read about other people's preferences, practices and theories about their clothes. I enjoy trying out different styles and shapes but I tend to stick with a couple of things which (I think) work for me. Like the rise. These trousers are fairly basic, based on my sloper, with the usual jeans features and the fit adjusted for the stretch denim. I used topstitching thread (which my sewing machine doesn't really like) for the flat felled seams and on the pocket edges and fly. There's really not a lot to say about these jeans. I think I'll enjoy wearing them though. I have enough fabric left over for another pair but I may first go back to some other trouser styles.